The SRW-5500 is Sony's first dual format recorder. Switchable between Sony's HDCAM and HDCAM SR record formats, this new VTR provides an ideal solution for professionals requiring multi-format flexibility. 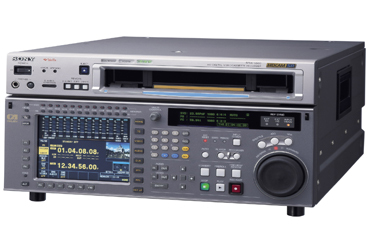 With the additional ability to simultaneously produce HD and SD output, as well as playback and up-convert Digital Betacam recording, the SRW-5500 can rightfully be considered a technology bridge to the future. Capable of recording 23.98/24/25/29.97/ 30PsF, 1080/50i/59.94/60i, and 720/59.94P, the SRW-5500 was created to meet all common worldwide delivery requirements. The HDCAM SR format is capable of recording the gamut of HD frame/line rates in both 4:4:4 and 4:2:2 formats using the highly efficient MPEG-4 Studio Profile compression scheme. The SRW-5500 records HDCAM SR format video at 440 Mbps, 10 bit Log or linear, at 2.7:1 compression ratio in 4:2:2, and 4.2:1 compression ratio for 4:4:4. It can also record 12 channels of audio at 24-bit per sample resolution. HDCAM format recording offers the standard 4 channels of uncompressed audio. The optional HKSR-5001 Format Converter provides 3/2 pull down sequence for conversion of 23.98 or 24 fps recordings to 59.94 interlaced output. It also provides conversion of 1080 to 720/59.94P, and 720P to 1080. With the optional HKSR-5002 Digital Betacam decoder board, Digital Betacam tapes can be played back and up converted to either 1080i or 720/59.94P formats. The optional HKSR-5003 interface board allows for full bandwidth 4:4:4 RGB recording, via dual link HD SDI. RGB 4:4:4 recordings can be internally converted to 4:2:2 output via the HKSR 5001 format conversion board in real-time during record or playback. HDCAM and HDCAM SR recording Maximum flexibility in one machine to meet current and future HD demand. 4:4:4 RGB record capability in HDCAM SR format (optional HKSR-5003) 4:4:4 recording is competitive with 2K data for high end archiving and digital intermediate workflows. 12 channels of audio Provides maximum benefit and flexibility to broadcasters and archivist that require more than 8 channels of audio for broadcast and DVD mastering.